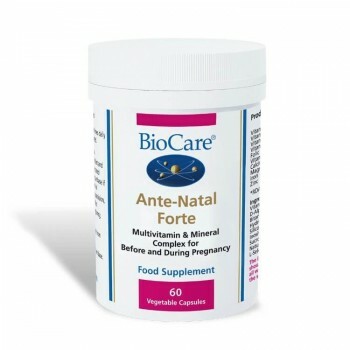 Formulated as a nutritional support during pregnancy and breastfeeding when there is an increased need for certain nutrients such as folic acid, vitamins B6, D and E, iron, zinc and calcium. Also provides antioxidant support from bilberries. Vitamin C (as Magnesium Ascorbate), Magnesium Citrate, Calcium Citrate, Vitamin E (as D-Alpha, Tocopheryl Succinate), Capsule Shell (Hydroxypropyl Methylcellulose), Choline Bitartrate,, Corn Starch, Iron Citrate, Zinc Citrate, Vitamin B6 (as Pyridoxine Hydrochloride), Dicalcium Phosphate, Anti-caking Agents (Magnesium Stearate & Silicon Dioxide), Olive Oil, Bilberry (Vaccinium myrtillus, Berry), Beta Carotene, Inositol, Potato Maltodextrin, Acacia Gum, Sunflower Oil, Chromium, Picolinate, Sucrose, Microcrystalline Cellulose, Antioxidants (Ascorbic Acid, Ascorbyl Palmitate &, Natural Mixed Tocopherols), Folic Acid, Potassium Iodide, Citric Acid , L-Selenomethionine, Vitamin, B12 (as Hydroxycobalamin), Vitamin D2 (as Ergl).